Cataloguing biodiversity on NCC properties is an important aspect of monitoring ecosystem health and alterations. Here, Mitchell MacMillan takes a photo of a plant to ID and record during an assessment on Holman's Island, PEI (Photo by Sean Landsman). The Nature Conservancy of Canada (NCC) can occasionally provide partial funding for applied research projects that directly address priority knowledge gaps identified in our conservation plans. Funding availability is variable, so please inquire early in the development of a relevant research project. NCC can act as a collaborator on research grant proposals such as Mitacs, and offer letters of support for projects that address our knowledge gaps. "Forest regeneration after disturbance": MSc position at Memorial University of Newfoundland (MUN) in partnership with NCC. 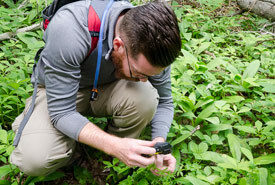 NCC also supports researchers by providing access to our properties and conservation information. Our properties include some of the most diverse, undisturbed habitats in Canada and serve as excellent natural laboratories. We collect considerable data on each of our properties. We can provide researchers with information on species, habitats and monitoring results from management actions. NCC staff can also contribute their expertise and will collaborate on research projects, particularly if they relate to ongoing or planned management actions. Many of NCC's management actions can be applied in a replicated, experimental manner. In some locations, equipment may be available to loan to researchers. This can include boats, canoes, ATVs, trailers, field computers, water-level transducers, chainsaws, greenhouses and equipment storage facilities. Field houses are also potentially available in Quebec and in other locations in British Columbia and Ontario. Availability and conditions vary among facilities. Please contact Angela Parillo (angela.parillo@natureconservancy.ca) for more information on funding and other resources.